Under the guise of my son’s birthday I enter the world of Laser Planet in Clydebank. Filled with nervous excitement we pile into a small dark room and are divided into teams. On the wall our flashing battle gear catches my eye. Copying the well-informed kids around me, I put on my armour and hold my laser gun with both hands – a single grip won’t do anything except get you killed. I’m having a wee practice with my gear when the word CYCLOPS pops up on the panel. Apparently this is me. 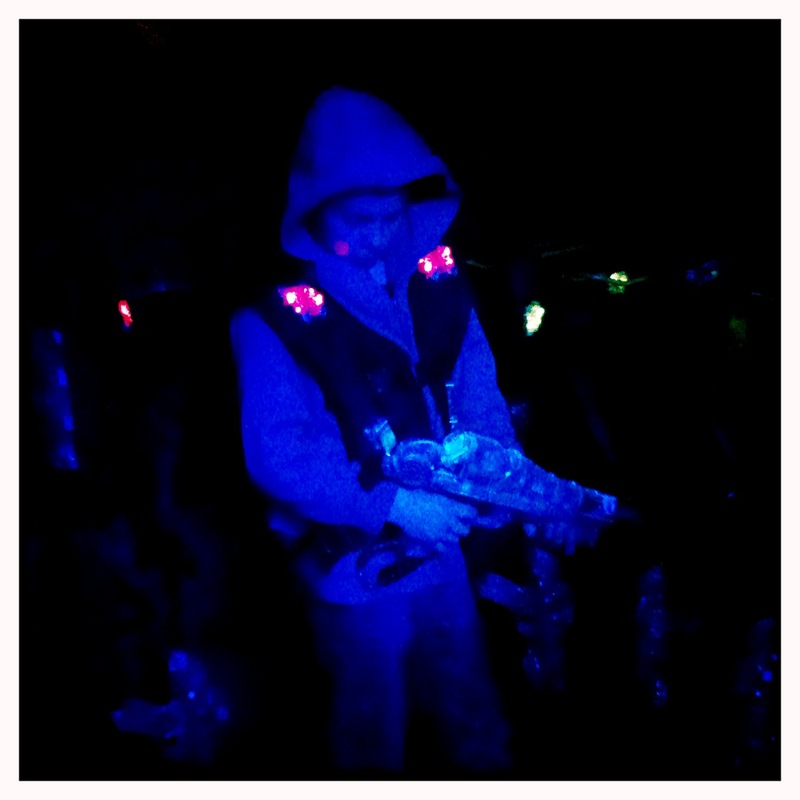 Named and garbed, I’m ready for my laser game debut. I follow the darkened labyrinth of twisting and turning corridors, blind corners, overhead bridges and nooks and crannies to find the prefect hiding spot in the infamous tower. The lights dim, hazy fog swirls around us, music blares and then the countdown began. I am CYCLOPS. I am focused. I am ready for action, my adrenalin charging, trigger finger pumping. The gun may say CYCLOPS but I’m working my best Charlie’s Angels – back against the wall, peeping round corners, leading with my gun, thinking I’m invincible. Until I’m not. My laser gun stops and names keep popping up on it – names like C3PO, Spiderman and Rogue – slick assassins that strike again and again, hiding in shadows and disappearing round corners. But thankfully my death is short-lived and I’m back in the game after 4 seconds. I return with a vengeance. I have to admit to a few rooky mistakes… shot my own team on a number of occasions, got shot in the back countless times and I never did manage to figure where those invisible killers were coming from. But at £11.99 for three games and party food, Laser Plant is a fantastic way to raise the adrenaline and connect with my inner one-eyed-angel. And it’s not just for kids. Up the ante – get a few friends and face-off with ‘grown-up’ rivals. So go on, use the force. Just remember to use both hands.